The Cannabis industry is one of the fastest growing markets in our economy, period. It is massively diverse, brings about an exciting startup landscape, and has the advantage of being valued at billions of dollars. Unfortunately, when it comes to marketing your cannabis business, whether it be a dispensary or affiliate product shop, you’ll quickly realize that it is an uphill battle. This is because there are a lot of problems that come with marketing and advertising marijuana, regardless of whether it is medical or recreational. In this article, we will explore the implications of legalization on cannabis marketing, how to develop content around cannabis marketing, and what type of cannabis you should be focusing on in your marketing efforts. What Marketing Implications Came With The Legalization of Cannabis? Even though cannabis is legal across thirty-three states for medical use, ten states for recreational use, and nationwide in Canada, companies are still presented with a massive challenge when it comes to advertising their businesses. Why? Marketing via advertising is practically near impossible due to the restrictions that have been set up to stop it from appearing “in your face”. Similar to tobacco regulations, you will not see any advertisements anywhere on television nor online as websites such as Google, Bing, and Facebook have strict no-policies against it. This is because the marijuana industry still remains controversial in the United States, as it has not been “federally” legalized across the entire country. In Canada, the consumption of recreational cannabis is legal but most forms of advertising and promotions are not. According to the federal Cannabis Act, the packaging and advertising of pot is sharply restricted, requiring all packaging to carry mandatory health warnings and prohibits any type of health benefits or graphics that go beyond the brand name. Just like alcohol and tobacco, cannabis companies cannot create print media, broadcast commercials, use sponsorships to promote products, advertise price or distribution, or even use celebrity endorsements. The only type of promotion allowed is where it cannot be seen by youth and the only advertising that is acceptable is factual and accurate information about the product such as THC and CBD levels and any information that would differentiate one brand from another. According to the social media giant Facebook, any type of cannabis business is banned from promoting and selling illegal drugs on the platform. This means that any business pages or groups that post about marijuana specials and products are in violation of the community standards and will be shut down. Other social media sites have taken the same approach, with banning of any marijuana business page, profile, or group that promotes the selling of illegal cannabis – some states this is recreational and in others both recreational and medical. These restrictions have made it so that companies must get creative with their marketing opportunities since the common practices of digital marketing are no longer available. Here are a few you should try out. 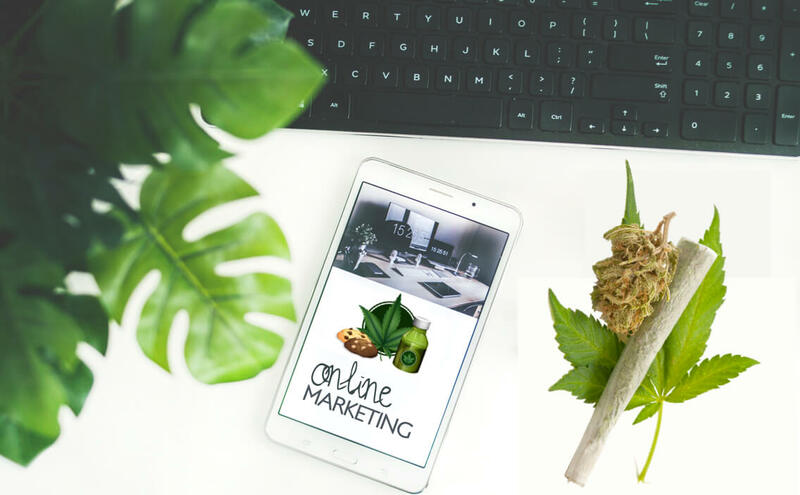 So What Digital Marketing Strategies Can Be Use to Market Cannabis? The number one method of digital marketing that cannabis companies should partake in is content marketing. When you create, curate, and distribute valuable content that entices and engages your audience, you end up with profitable customer actions. As opposed to trying to sell your products forthright, get into the business of using content marketing to educate your prospects with relevant content that is informational and easily accessible. Not only are you providing truly useful content to your potential prospects and current customers, but you are also helping them solve their issues at the same time. The only catch, focus on medical marijuana as this allows you to educate to a “cold” audience, those who are new to medical marijuana who may want to use it to treat unique needs. Plus, you end up with a lot more marketing material avenues with regards to topics and information. Once you’ve provided enough educational information to help individuals understand your products, you are better able to move them through your conversion funnel from a “cold” to “hot” audience. The process is simple, educate those who know very little about the health benefits, get them interested in your products, and then convert them into a “hot” audience who is ready to purchase your edibles, medicinal weed, and oils. To get yourself started, consider creating e-books, infographics, blogs, and videos and provide material that answers questions. You can offer these as free material on your website or use e-mail marketing to garner e-mail addresses. Regardless of what route you go with, search engine optimization should also be included as your next digital marketing strategy. After all, you need your content to be found on popular search engines with the right keyword search phrases. Use a keyword strategy on your website, blogs, articles, images, metadata, and website pages to rank your content. This process can garner traffic for free through organic or natural search results from those who are looking on Google and Bing for information on a particular plant, edible, gadget, or oil. Doing this requires no advertising which gets you around the current restrictions. As the cannabis industry continues to grow, more and more companies will be entering the market with educational and valuable content. We don’t want you to get left behind and with so many creative opportunities out there for content creation and innovation within the industry, we would like to help here at Let’s Nurture. We have a large local presence in both the United States and Canada, have experts in the field who understand cannabis industry app development and we provide end-to-end website and mobile development solutions for small and large scale businesses. If you are looking to get into the cannabis market but are not sure where to start, get in touch with our expert consultants for instant help.